Welcome to our Fairy gift ideas page! Packed full of things for those who love fairies, we have found lots of fairy related goods, fairy facts, fairy gifts and fairy fun for you. From fairy jewellery to fairy clothing, you can kit yourself out in fairy merchandise or buy a fairy present for a fairy obsessed friend. Made of reconstituted stone and polyresin, this fairy sculpture has all the effect of solid stone but at a fraction of the weight. The long-haired maiden sits contemplatively upon a rock, much like the famous mermaid in the harbour of Copenhagen. Place her next to your own water feature or anywhere in your garden for a pleasing effect you’ll enjoy for years to come. The Fairy cottage is made from 100% cotton and appliqued and embroidered with fairies, flowers and hearts creating a perfect pink paradise. The windows are finished with pretty curtains that can be closed from inside. Assembling your beautiful little cottage is really easy, it has a light aluminium frame so you can erect the playhouse indoors and outdoors. When you're ready to pack your cottage away simply fold into the storage bag included. Part of our collection of home lighting comes this beautiful kids 2 tier pendant by designer brand Sass and Belle. 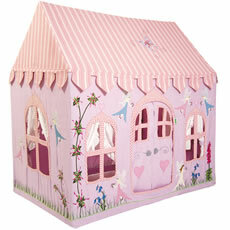 A beautiful design that little girls are sure to love, the white shade features a fairy dancing. 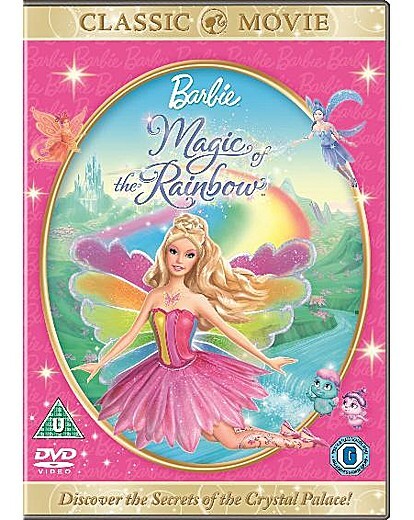 Fairy magic' is a vividly coloured piece of fantasy art that will surely brighten up your day. With 2000 pieces, the jigsaw puzzle is as beautiful as it is challenging to assemble. Inspired by some of our favourite fairy tales, this delicious hollow milk chocolate princess model is decorated with beautiful white and pink chocolate. Made from royally rich chocolate, this will go down a treat with your little girl! Plus you can now ice this model for FREE, just add your personalised message for the perfect gift! Silver Jubilee Tooth fairy box featuring official Jubilee hallmarking. Hallmarked silver Jubilee gifts carrying the official Diamond Jubilee hallmark. Dangerously high levels of 'cuteness'. Every time a child say 'I don't believe in Kitten-Fairies' a Kitten Fairy T-Shirt unravels. Only for the very brave, or very ironic. Watch Angelica flutter up to three metres high as she takes to the skies. Simply pop Angelica onto her flower launcher, pull on the magic chord and see her soar gracefully into the air with fluttering wings and posed twists.gracefully into the air. A brilliantly designed wallpaper with a Fairies theme. Perfect as a children's gift, this three piece fine china set from Monsoon has a pink butterfly fairy design and includes a plate, cereal bowl and mug. 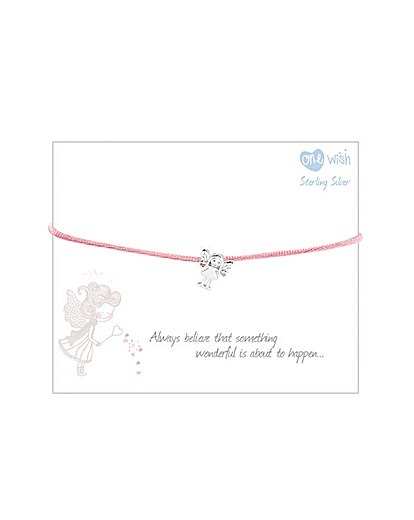 The Fairy is Threaded On A Soft Pink Silk Threaded Bracelet Which is Size Adjustable With The Chinese Knot Finish The Bracelet is Beautifully Presented on a Sentiment Quote Card "Always Believe That Something Wonderful is About to Happen..."
With this whimsical guide, readers can join the Disney Fairies and enter the enchanting world of Pixie Hollow, where believing is just the beginning! Disney Fairies: The Fairies Encyclopedia delves into the lives of Tinker Bell and her friends, exploring characters and locations. Officially licensed fantasy mug. Featuring a Gothic fairy below the moonlight with her finger creating ripples in a pool of water. A truly stunning fantasy mug, complete with presentation box. A beautiful bedroom ceiling pendant, this suspension light has been designed to look like fairy flying through the air. Stunning and beautiful, the light is simple in design but sure to be loved by your little girl. Made from Plastic, the light comes flat packed and requires a small amount of self assembly. Push out the pieces and slot together - simple and easy, the light will be put up in next to no time. This enchanting bottle captures the three-sided dimples of the original Secret Wish bottle, with the fairy perched on top. The precious potion radiates from within, a soft peachy juice that captures the sunlight in the fantasy garden. The carton shimmers like fairy mist, with signature embossing that makes the story come to life. This brightly coloured handcrafted Mimi Fairy Wooden Music Box would make the perfect gift for a new baby or small child. The subtle sounds will make baby drift off to sleep, while a small child will love to watch the fairies dance to the music. Soft and comfortable to wear purple silicon strap. White dial featuring a fairy design. The combination of the quartz movement and easy to read numbers and hands help to ensure high levels of accuracy. Includes a one year guarantee. Sterling Silver, Simulated Pearl. Garden Fairy Design. Lobster Clasp. Sale item, half price. Add some magic to your childrens magic box with this beautifully designed costume. The costume features a lovely shade of pink dress with attached pink and green tutu and wings. MUA's One Coat Glitter! Get full coverage in 3 fab shades with one easy application of this amazing glitter polish! This fine art giclee print is based on a painting entitled The Fairy Dance by Grace Jones. Active from around 1900 onwards, the artist is noted for their fantasy works. Primarily based around a light blue palette this landscape format print features child themes. This pair of rhodium-plated earrings, specially created for Tinker Bell lovers, features the famous fairy in a classic pose. Sparkling in Crystal Moonlight and clear crystal, they are ideal for everyday wear. Add the matching pendant for the perfect look! Remember to visit our blog for for even more gossip and facts about fairies!